Thought this should get its own page now that construction is imminent. According to the LSJ, the Gateway - which will expand downtown westtward - is set to begin construction. EAST LANSING – Site clearing for the $8.5 million Gateway project is expected to begin within two weeks. 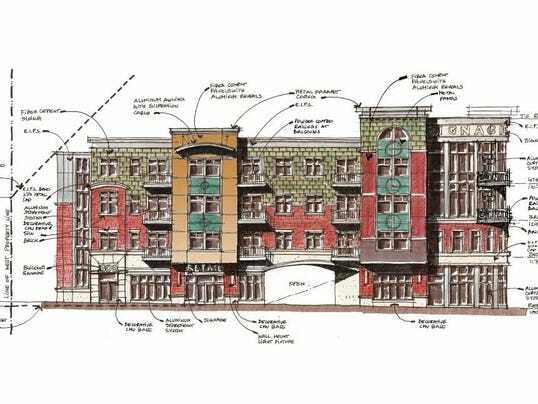 East Lansing will reimburse $1.8 million to Lansing Township-based DTN Management for its brownfield redevelopment of 300 W. Grand River Ave. near Delta Street into a four-story mixed use building. The project will include 6,500 square feet of commercial space on the first floor and 39 two-bedroom apartments on the other floors. The Gateway will also include a one-level, underground parking garage. DTN will get brownfield reimbursement dollars for construction of the garage, said Tim Dempsey, East Lansing’s planning director. Site Plan & Elevations. This building will rise to the max height of a building outside the downtown zone of 64'-0". Slight correction, this will expand downtown westward. But downtown won't really feel expanded westward until the City Center II project is completed. DTN broke ground on the development today and hopes to have it complete by Fall 2016. It will have 39 residential units and cost $9.5 million to build. The article mentions "6,500 feet of pedestrian-oriented retail and new housing options". This statement is a bit confusing, perhaps they meant there will be 6,500 square feet of commercial space along with the residential units? Pedestrian-oriented implies ground floor storefronts, which has been what's planned for the site. It's just a different phrasing. The site's been fenced off for maybe two weeks and there's a sign with what looks like the same rendering as a few posts up. They've also been drilling/driving piles for the foundation for about a week, so work is well on its way. That's good to hear. I just had to remind myself that the road that the building is spanning over is not Delta St, it's in fact the drive-thru for the bank that was mentioned in the article. The city shouldn't have let a drive-thru get constructed here, it's bad for pedestrians and takes away potential retail space in the middle of the building. I agree a full row of shop fronts would have been a better idea. Just how many people will need to use a drive thru there for banking? I am not sure but it could not be that many. Is that feature really worth the space it takes up is what I would ask. Plus it would seem to be a difficult spot to turn back onto Grand River meaning cars would have to sit there waiting blocking the sidewalk. I didn't know that the gap in the ground floor was for a drive through, I was wondering why they'd kept that element since it won't be spanning the street anymore. It really does seem like a dumb thing to do. The crane working at the site of 300 Grand tipped over today. No major injuries to workers, but minor damage to the crane. I'm not sure what delays this may cause, as I'm sure OSHA will want to take some extra precautions at the site. Thankfully nobody was injured, the crane fell on a portapotty and an excavator. The steel frame is now up on the site, showing a glimpse of the height of the development. It can be seen for some distance east down Grand River.